Have you ever noticed line 79 on your individual income tax return (form 1040). It’s your estimated tax penalty. You paid your taxes and you may have even received a refund, so what gives? Per IRS rules, it’s not just enough to pay your taxes for the year. They must be paid at prescribed time intervals. The year is divided into four due dates for estimated tax purposes. Generally, those dates are April 15, June 15, September 15 and January 15. You must pay federal estimated taxes in 2017 if you 1). expect to owe at least $1,000 in taxes after subtracting your tax withholding (if you have any) and tax credits, 2). and you expect your withholding and credits to be less than the smaller of 90 percent of your 2017 taxes (the annualized method) or 100 percent of the tax on your 2016 return. If your 2016 Adjusted Gross Income was more than $150,000 ($75,000 if married filing separately), substitute 110 percent for the 100 percent requirement (the general method). If you have income from self-employment, interest, dividends, alimony, rent, gains from the sales of assets, prizes or awards, then you may have to pay estimated tax because these items generally aren’t subject to withholding but are subject to tax. If you also receive salaries and wages, you may be able to avoid having to make estimated tax payments on your other income by taking more tax out of your paycheck. Here are five additional points you should consider regarding your estimated taxes. To figure your estimated tax, include your expected gross income, taxable income, taxes, deductions and credits for the year. You can use the worksheet in the estimated tax for individuals form (form 1040-ES). Also, consider changes in your situation, like increases or decreases in business or investment income. If you’re having problems calculating your estimated taxes using the annualized method, consider using the general method. However, if you’ve made significantly more money in 2017 than 2016, you may owe more taxes on April 15, 2018. Ask your CPA to prepare tax projections using several income scenarios and have them updated as the year progresses. This option may be appropriate as income projections change, and depending on the president and Congress, there may be tax changes ahead for this year. You can make more than four estimated tax payments. To do so, make a copy of one of your unused estimated tax payment vouchers, fill it in, and mail it with your payment. If you make more than four payments, avoid a penalty by making sure the total of the amounts you pay during a payment period is at least as much as the amount required to be paid by the due date for that period. The disadvantage to using the annualized method as opposed to the general method is the calculation of your estimated tax payments may be more complex. Plus, your estimated tax payments must be recalculated at the end of every quarter. 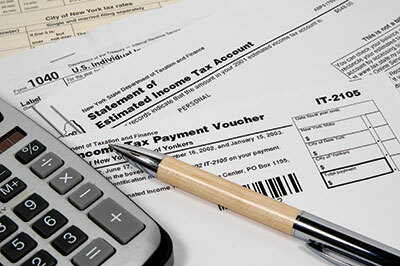 If you make an estimated tax payment using the annualized method for a quarter, you may change to the regular method for a subsequent quarter, but you must recapture the difference between the annualized income installments and the regular installments by adding the amount of the differential for all previous periods to the regular installment for the next payment period. For example, if you estimated a tax of $1,000 under the general method, $250 would be due each quarter. If you used the annualized method for the first quarter and paid $100, and then shifted to the general method for the second quarter, the second quarter installment due would be $400 ($250 for the second quarter plus $150 unpaid for the first quarter). An underpayment penalty is imposed on each underpayment for the number of days it remains unpaid. A penalty may be applied if you did not pay enough estimated tax for the year or you did not make the payments on time or in the required amount. A penalty may even apply if you have an overpayment on your tax return. The penalty is essentially an interest calculation at a rate of 4 percent per annum. It’s not necessarily the worst outcome. Many CPAs include 2017 estimated tax vouchers with their clients’ 2016 tax returns. When there is a material balance due on 2016 returns, vouchers are prepared using the safe-harbor estimate under the general method to avoid 2017 under payment penalties. Check with your CPA to ensure he or she has considered the underpayment penalty when doing your tax planning.